Jehan de Lescurel’s known songs are all in a single manuscript from the second decade of the 14th century, and he is identified as their author only in the acrostic of one of the songs: we just assume, from their unity of musical and poetic style, that they are all by him. But this is a collection of massive importance, not least because this is more or less the first place where the three formes fixes of medieval French song appear in their classic form. His music has in general been less recorded than one might expect, but the special feature of the present issue is that it contains everything apart from two diz entez which are difficult to perform realistically. Not only that, but in order to get everything on to a single CD the musicians of the Ensemble Céladon have been less tempted to fill out the music with introductions and interludes. 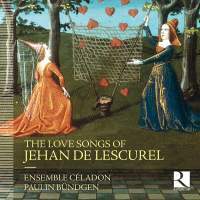 The result is that in every case you get a clear aural perception of the musical and poetic forms – which in the case of Jehan de Lescurel seems to me the most important thing. The CD will therefore be a perfect entry point for students wishing to understand this repertory. To help even further, they have presented the music more or less in manuscript order. Clara Coutouly sings the songs whose texts are entirely in the female voice; Anne Delafosse sings those whose texts could have a man or a woman singing; and Paulin Bündgen takes the main role in the remainder (though all three wonderful musicians take some part in almost all the songs). Five instrumentalists offer what is on the whole a thoroughly discreet accompaniment. These are all performances on a very high level. No purchaser will be disappointed.